Thanks to all my readers for the get well wishes. I'm glad to say that I'm finally back in the swing of things, and feeling in desperate need of a project. There seems to be a lot of blogging lately about stashes. They're being agonized over, sorted, reorganized, and used. Mine, I'll admit is pretty small. I have 4 lengths of fabric, a drawer full of various interfacings and a bag of scraps. Now would be a good time to reduce the stash. 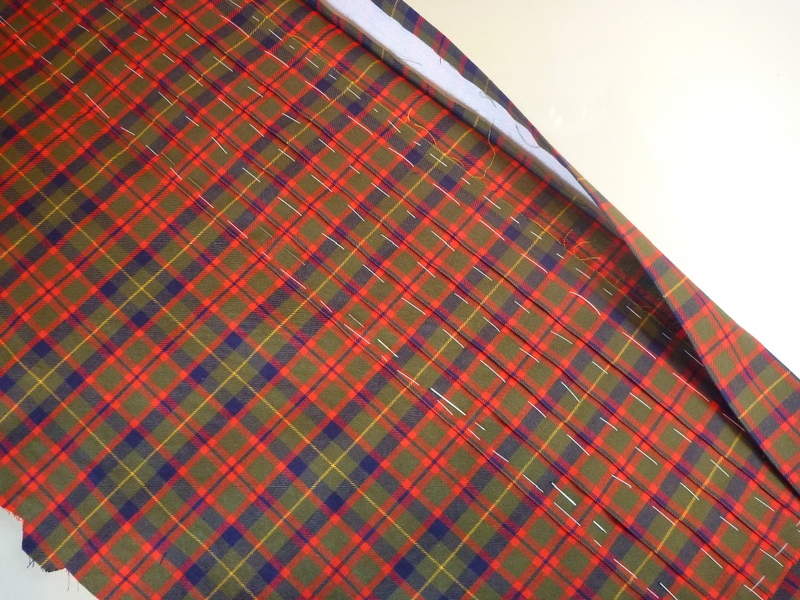 I've decided to make another tuxedo shirt, this time with some tartan shirting that I bought from Denver Fabrics back in January during one of their free shipping promotions. 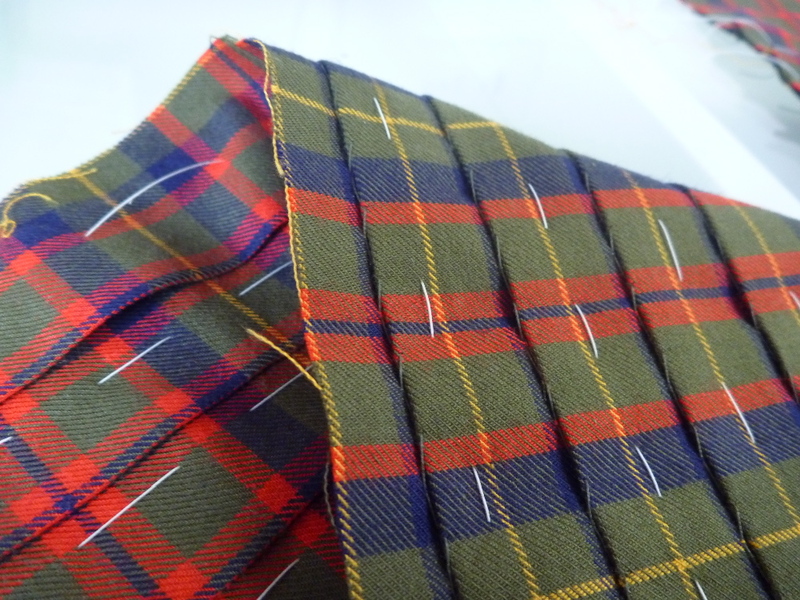 It's really very nice fabric, a fine twill weave actually, in red, olive, navy and yellow. There is really not much to making a tuxedo shirt. The pleats are actually a separate piece of fabric sewn onto the shirt fronts. So any shirt that fits you well can be pretty easily dressed up with just a couple of additional steps. The plaid will be an extra challenge, but these kinds of challenges are what makes sewing fun for me. 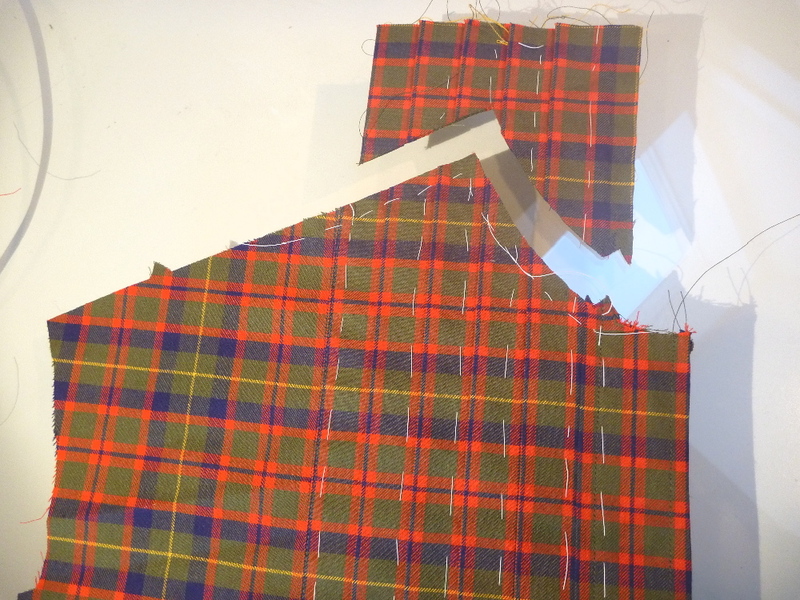 I cut a strip of fabric and experimented with various pleat sizes and matching strategies. I decided on this arrangement which emphasized more red. 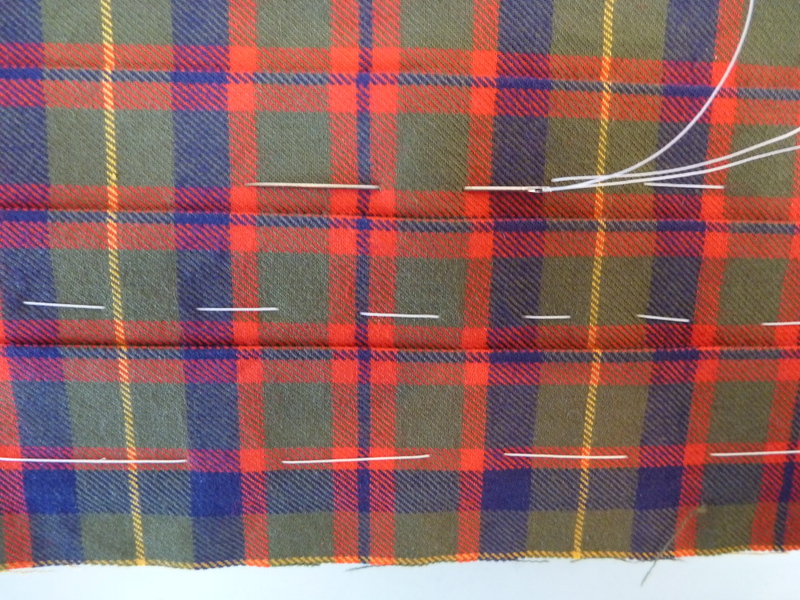 The plastron (pleated panel) will finish out at 3.75 inches wide. So here is my sample and the width of fabric that will be required to make it. It takes about 3 times the width of the finished plastron. 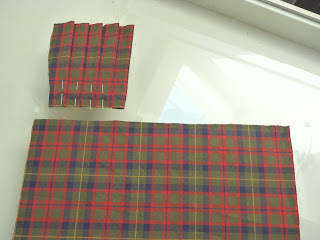 I pressed each pleat and then basted them into position, trying to match the plaid as carefully as possible. It's hard to see, but on the reverse side I slipstitched each pleat to the backside of the adjacent pleat. 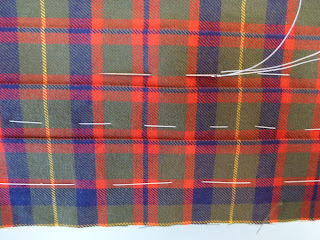 These stitches are invisible from the front and will hold the pleats in place when the basting is removed. At least that's the plan. 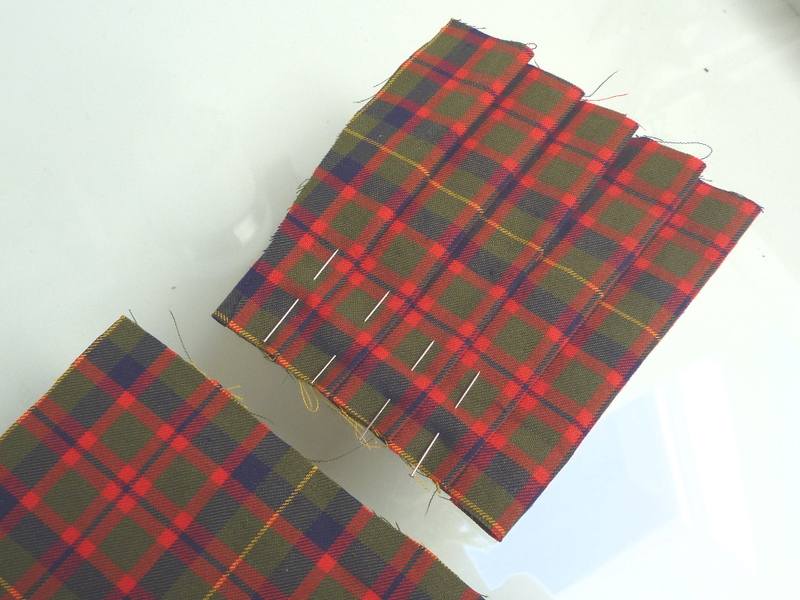 The pleated plastron is slipped under the interfaced front band and basted into place. Then it's edgestitched to the shirt front along the bottom and side. The front band is pressed over and topstitched just like any other shirt. I'm really pleased with all the matching. This is when a little extra attention to detail really pays off. Yay! FYI -- The plastron is cut long enough to extend beyond the neck edge and shoulder seam. Lastly, the excess is trimmed off and the upper edge is basted to hold the pleats in place. From here on out it's just basic shirt construction. Oooh it's going to be lush! Isn't there just something so rewarding working with plaid and making it all line up? That is going to be one cool guy shirt! Maybe spending your summer under a cloud/blanket has given your mojo an extra boost. Looking forward to the finished project! Welcome back to the sewing side of life! 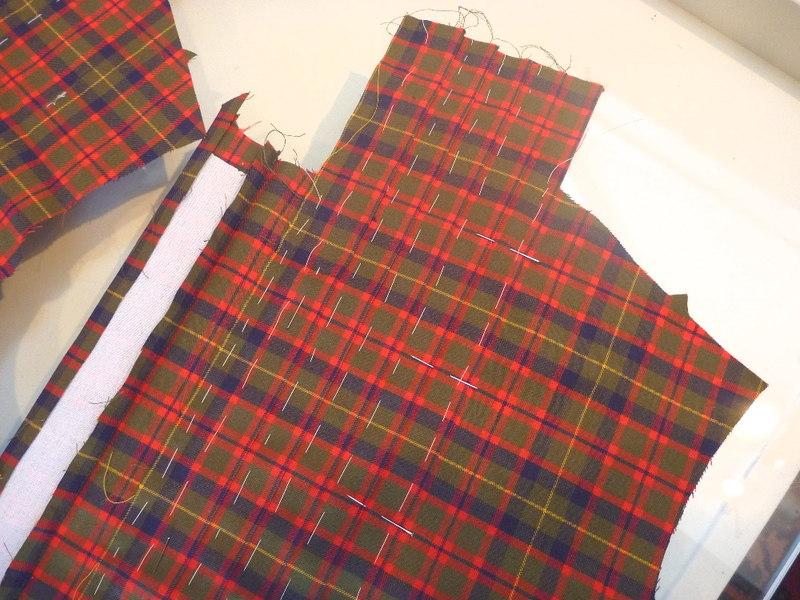 With all the practice pleating on a tartan, you might think seriously about doing a real kilt - same thing. I agree with Helene you should seriously think about that :) In the beautiful Clan MacLeod tartan!